Whether you are venturing to Port Stephens as a budget or luxury traveller, Wotif can help you plan your ideal getaway today. There are approximately 28 000 individuals in this North Coast destination. Sydney, the state capital, is roughly 150 kilometres to the southwest of this destination. Alternatively, Tea Gardens is 12 kilometres to the north. Kids coming too? You're in luck, this area has activities for every family member! One of the most recommended spots is Australian Reptile Park. If the kids are still bouncing off the walls, you can then head over to Salamander Super Strike, another attraction worth considering. The sea is home to millions of species, so you and your little ones had better start introducing yourselves. Plan a trip to Irukandji Shark & Ray Encounters to encounter some of the familiar, and the not so familiar, aquatic species of our blue planet. If you enjoy a tasty glass of beer, visit the Murray's Craft Brewing Co and discover how this classic drink is created. Wine has been used in celebration since at least 6000 B.C. You'll be grateful to your ancestors at the Port Stephens Winery, where ancient practices have fused with the new to create a local wine collection of the highest standards. Tomaree National Park is a lovely green space to have a break from seeing all those sights. Alternatively, go for some exercise or simply watch the birds at Longworth Park or Corlette Point Park. Don't hit the frog and toad without making a trip to one of the local nature reserves and parks. Two main spots are Winda Woppa Reserve and Myall Lakes National Park. 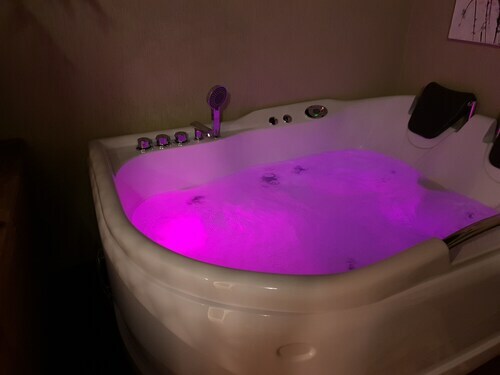 Do you have a few more days? Then you'll want to consider Dark Point Aboriginal Place and Tomaree Head as well. 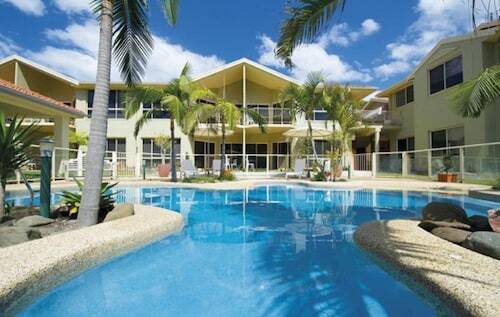 Travellers who love nature will be pleased to discover that Port Stephens cares about its gorgeous oceans. Fly Point Marine Reserve is a conservation spot that provides a refuge for ocean critters. Slip back into Port Stephens' past at Bulahdelah Court House and Stroud Clock Tower, two of Port Stephens' unique historic sites. Get a glimpse of the holy side of this area at Baptist Tabernacle. Time may have passed it by, but this only contributes to the atmosphere of this important site. Gan Gan Hill Lookout presents to travellers a chance to check out a little slice of this city's identity. Even if you couldn't care less about their historical import, the impressive appearance of some of the area's diverse lighthouses make them worth visiting. Sugarloaf Point Lighthouse and Nelson Head Lighthouse draw great numbers of locals and tourists alike who are keen to experience the region's interesting seafaring culture. If you can free up one or two extra days, your mob might also enjoy visiting Point Stephens Lighthouse or Heritage Light House Cottage. At Salamander Bay Shopping Centre you can hang with the locals, browse the shops and give that credit card of yours some time in the spotlight. Port Stephens, with its superb selection of golf courses, is known to entice the golf pro and casual enthusiast alike. To get yourself started, there's the Karuah and District Golf Club or the Hawks Nest Golf Club. If that's not going to be enough time on the fairway to make a holiday worthwhile, the Bulahdelah Golf Club and the Nelson Bay Golf Club should work to fulfil that need for golf. If you're pressed for time but you and your mates still hope to fit in a couple more local activities, you have loads of choice. So, grab your itinerary and pencil in visits to the Toboggan Hill Park, Myall Park, and the Stroud Country Club. 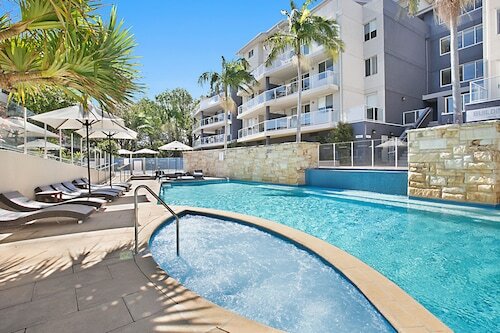 Offering direct access to the beach, this Nelson Bay apartment building is within a 10-minute walk of Myall Lakes National Park and Tomaree National Park. Dutchies Beach is 1.9 mi (3 km) away. Nestled on the beach, this Corlette hotel is within 3 mi (5 km) of Port Stephens, Dutchies Beach, and Tomaree National Park. Corlette Point Park and Myall Lakes National Park are also within 5 minutes. 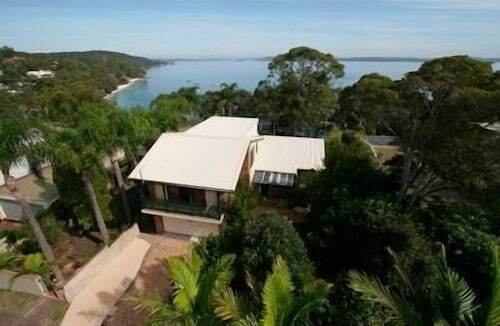 Located in the heart of Nelson Bay, this luxury bed & breakfast is within a 15-minute walk of Myall Lakes National Park and Tomaree National Park. Dutchies Beach is 0.9 mi (1.4 km) away. 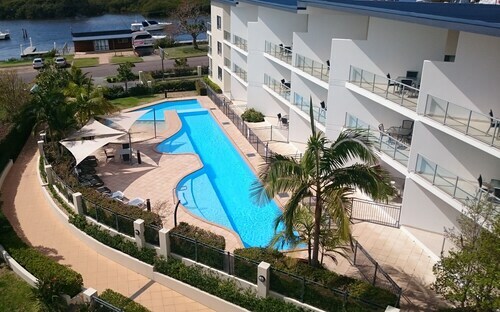 Located in Nelson Bay, this beachfront apartment building is on the boardwalk and within a 5-minute walk of Myall Lakes National Park and Dutchies Beach. Tomaree National Park is 1.4 mi (2.2 km) away.